New - published by Forest Town Heritage Group September 2013, 156 pages including illustration, maps etc. The book - looks at a poignant part of our history - the first World War 1914 -18. It was a war that altered the lives of many people as it extended from the anticipated few months into four years. In the Nottinghamshire town of Mansfield the call for recruitment had a two-fold effect. 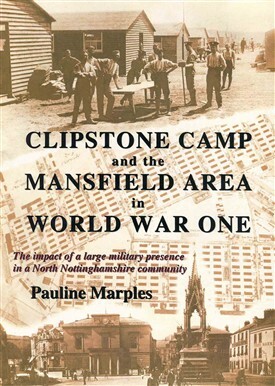 A large number of men enlisted and moved away and an even greater number of soldiers moved into the area to live and train at Clipstone Camp. It was one of the largest hutted camps in the country erected to accommodate men of the new armies raised by Lord Kitchener, and it had a big impact on the surrounding villages, town and countryside in North Nottinghamshire. The camp and the integration of thousands of soldiers into the area brought additional spending power into the locality and quick thinking entrepreneurs took advantage of this. The social implications of the camp were many. Local people and organisations became involved in the moral welfare of the soldiers. Alternatively the moral welfare of young girls was a concern and 'some ladies' were banned from the vicinity of the camp. Beds in the hospitals were needed for war wounded. Schools and local women became involved in events to raise funds and equipment for those participating in the war. However, for the communities of Mansfield, the camp played a significant part in the people's war. Introduction, Recruitment, Clipstone Camp, Camp Life,The Social Impact of the Camp, Mansfield And The Reaction To War, The Local Women's War, Women In Uniform, The Closing Years, Remembrance. The book is indexed and the Appendix contains a list of 56 soldiers and 1 nurse whose death or inquests were relevant to Clipstone Camp. This page was added by Pauline Marples on 29/09/2013. For the interest of local readers this book is now available to purchase at Mansfield Museum, Forest Town Post Office, Forest Town Library and the Bookworm, Spa Lane East Retford. I have just finished reading your excellent book Pauline, I felt I had been transported back to 1914 -1918, Well done. The sales outlets for this book are spreading, additional to my comment above it is now available at The Book Case, Main Road, Lowdham and Mansfield Woodhouse Library. As we have a number of copies of this book left and in line with the commemorations of the end of the Great War left we have now reduced the book to half price, now £5 plus £2.50 postage.